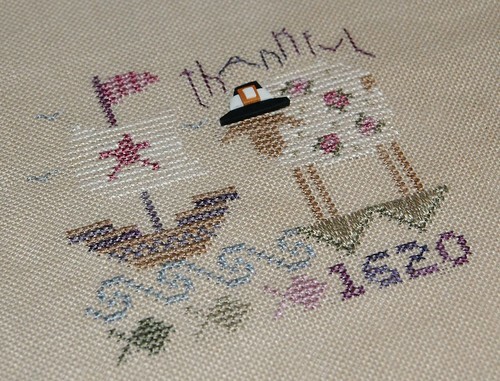 Nicole's Needlework: Thankful Sheep Finished! I got it finished up today! It was a fun, quick stitch! Love it - so sweet!!! Hey, nice new look to your Blog, Nicole. Hope your boys are doing well. Sooo cute! I just love these little SB sheep! That is adorable! Great finish! Love the hat he/she is wearing...cute cute! Oh, I really like that one! Turned out beautiful! This turned out sooooooo cute and you must be the fastest stitcher ever! I love Shepherd's Bush things too. Yours is just lovely! I agree - very, very cute! he's really cute! you are just too fast! can't wait to see what's next! Very sweet - love his hat! What a sweet little sheep :) Your LHN is looking great, too! Adorable Nicole. I love these SB sheepies, and you do such a great job with them. Stitch on! Can't wait to see what you come up with next. congrats on the cute finish. you won my giveaway, please contact me! Thanks! Very sweet colours and lovely finish Nicole! That is so cute, Nicole! Congratulations on the finish!